We are discerning chilli heads; we love not only hot ramen, but any kind of spicy punishment. We know there are other sites out there that rate the heat level of ramen. We love those sites! But we found them lacking one important metric; the punishment experienced later in the day! We found that the level of punishment didn’t always equate to the heat of the product. This is a metric we need to report on. PP Level is “Porcelain Punishment Level”. Its a scientific metric that we use to rate what level of punishment you will be receiving for having consumed the ramen. Yes; you are smart. So you know this. But think about this; don’t you want to be able to eat spicy food whenever you want no matter the situation! What if you have a hot date tonight? You will probably forgo the spicy goodness to avoid the embarrassment of a mid-date toilet run (or multiple). This is where we come in. You can use our rating system to work out just which noodles you can eat and still have a successful date! See; this stuff is important. 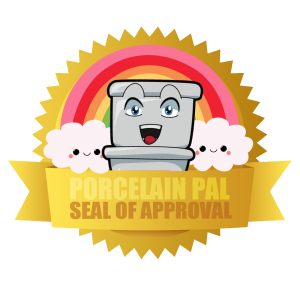 What is your Porcelain Pal ‘Seal of Approval’? Oh you mean this little guy? We reserve him for the best of the best; the product needs to fill three important metrics; High Heat Level, Good Taste and Minimal Regret. We use this to help you guys know what you should be eating if you want a delicious spicy treat without any of the regret. Be on the look out for this guy! Look how happy he is (and you will be too)!